KIEV, Ukraine -- Ukrainian President Petro Poroshenko said Ukraine is prepared to restore electricity to Crimea after more than a month of severe outages, but only if the peninsula annexed by Russia rejoins Ukraine. 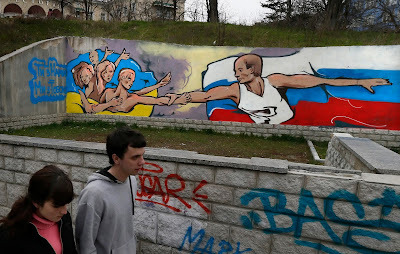 Graffiti depicting Russian President Vladimir Putin in Simferopol, Crimea. “We are ready to supply electricity to Crimea that is Ukrainian. You can have it if you want. If not, we’ll wait until Ukrainian sovereignty over Crimea is restored,” Poroshenko said. Crimea, which Russia seized from Ukraine in March last year, has suffered repeated power cuts since the annexation, underlining its reliance on Ukraine for electricity and fuelling a downwards spiral in relations between Moscow and Kiev. Russia has refused to go along with Ukraine’s conditions for renewing a contract that expired on January 1 to provide Crimea with electricity. Poroshenko said Ukraine is prepared to “assure supplies of electricity,” but the contract must stipulate that Crimea is an “autonomous republic” of Ukraine. He insisted that Kiev is doing what it can to “prevent more complications in the lives” of Crimeans, but pointed out that Crimean leaders themselves had declined to renew the power contract. Residents of the peninsula have been experiencing chronic power shortages since the main lines carrying power from Ukraine were blown up on November 22. A partial restoration of electricity during December came to a complete halt after another attack on the power facilities on December 30. In a parallel development, Ukrainian state energy firm Naftogaz has agreed to buy 1.7 billion cubic metres (bcm) of gas from European suppliers at a price of $188-$211 per thousand cubic metres, the company said in a statement on Thursday. Ukraine, which is still in a protracted gas pricing dispute with Russia, has been seeking to cover its needs with its own production and supplies from Europe. Ukraine has said it has enough gas to safeguard supplies over the winter and ensure stable transit of Russian gas to Europe.